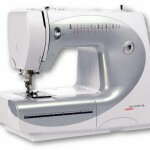 Ease of operation, automatic one-step buttonhole, 7mm-wide decorative stitches and simple threading allow you to accomplish all sewing tasks easily and confidently. The base plate guarantees smooth and quiet running and absolute stability. The bernette 66’s handy size makes it a popular companion on your travels and at workshops and courses.